EVER HAD A FRIEND DIE? I MEAN A FRIEND DIE WELL BEFORE THEIR TIME? 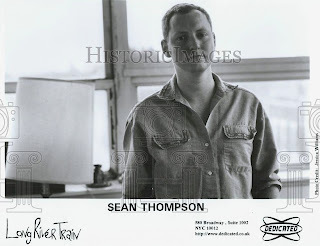 I NEVER HAD UNTIL MY OLD FRIEND SEAN THOMPSON PASSED AWAY LAST SUNDAY FROM LEUKEMIA AT THE AGE OF 43. I HADN'T SEEN HIM IN ALMOST 10 YEARS, I THINK SINCE THE SUMMER OF 2004. I CAN'T EVEN REMEMBER WHAT WE DID THAT NIGHT BUT I KNOW WE STARTED OFF AT THE ORANGE VALVE BAR IN THE EAST VILLAGE...WE GOT DRUNK, SEAN WAS HITTING ON GIRLS IN HIS USUAL OVERBEARING MANNER. THAT IS TO SAY HIS USUAL EMBARRASSING MANNER. HE WAS A SCRAWNY GUY... I MET HIM IN THE FALL OF 1991 WHEN HIS BAND, THE COMMON THIEVES, TORE IT UP AT A BASEMENT PARTY IN THE T.H. HOUSES AT VASSAR COLLEGE. AFTERWARDS WE TALKED ABOUT THE REPLACEMENTS AMONG OTHER BANDS. I GOT TO LIKING HIM WHEN I HEARD THE STORY OF HIM TAPING OVER THE RITUAL DE LO HABITUAL CASSETTE TO RECORD SOMETHING HE LIKED BETTER, BECAME TIGHT WITH HIM IN THE FALL OF 1993 WHEN WE BOTH LIVED IN PROVIDENCE AND WORKED AT THE BUCK-A-BOOK USED BOOK STORE (A JOB HE GOT FOR ME) AND BONDED OVER COUGH SYRUP WHICH WE DRANK TOGETHER ABOUT 5,000 TIMES. I HELPED HIM MOVE INTO HIS APARTMENT WITH THE KIDDIE FURNITURE IN SOUTH SLOPE BROOKLYN IN THE SUMMER OF 1994. I FOLDED HIM UP INSIDE A CONVERTIBLE COUCH AT A HOTEL IN ATLANTIC CITY IN 1997 WHEN WE WERE AT A FRIEND'S BACHELOR PARTY. SEAN HAD GOTTEN DRUNK AND WAS DESTROYING THE ROOM. HE NEVER DID PAY FOR ANY OF THE DAMAGE HE DID.... 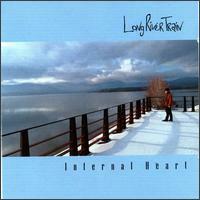 I SAW HIM PLAY INNUMERABLE GIGS UNDER HIS OWN NAME OR WITH HIS BAND- LONG RIVER TRAIN-HIS SOLO PROJECT/BAND THAT RECORDED 2 RECORDS FOR THE DEDICATED LABEL IN THE MID-90S. HE WAS ALSO THE TOURING GUITARIST FOR A BAND CALLED IVY AROUND THIS SAME TIME, A GIG HE WOULD QUIT TO FOCUS ON HIS OWN MATERIAL. IN 1998 HE GOT ME ANOTHER JOB. THIS TIME WORKING THE GRAVEYARD SHIFT AT CHELSEA BILLIARDS ON 21ST STREET IN MANHATTAN. HE WORKED THE MORNING SHIFTS AND WOULD RELIEVE ME ON MONDAYS. I SAW HIM ON A REGULAR BASIS UNTIL 1999 WHEN HIS LIFE SEEMINGLY STARTED TO SPIRAL OUT OF CONTROL. I SAY SEEMINGLY BECAUSE I ONLY CAUGHT A GLIMPSE OF HIM HERE AND THERE BUT EVERY TIME I DID HE WAS JUST ABOUT AS FUCKED UP AS YOU CAN IMAGINE. BY THIS TIME HE HAD TAKEN UP WITH A NEW GIRL (OF WHICH THE LESS IS SAID THE BETTER) AND THEY EVENTUALLY MOVED TO THE WEST COAST AND...I REALLY DON'T KNOW..HE LIVED IN SEATTLE FOR A TIME AND WOULD COME BACK TO NYC TO VISIT PERIODICALLY, STAYING AT A FRIENDS HOUSE. I SAW HIM ONCE IN 2001/2002 AND THEN AGAIN THAT NIGHT IN 2004....AND THAT WAS IT. I GOT WORD A FEW MONTHS AGO THAT HE HAD LEUKEMIA AND THE OUTLOOK WAS PRETTY BLEAK BUT IT JUST NEVER OCCURED TO ME...I'M NOT GOING TO WRITE ANYTHING CORNY HERE LIKE CALL YOUR FRIENDS AND TELL THEM YOU LOVE THEM OR ANY SIMILAR SENTIMENT. THE THING I TAKE AWAY FROM THIS IS, COUGH SYRUP IS STILL A CHEAP WAY TO GET REALLY, REALLY FUCKED UP, THE 90S WERE A GREAT DECADE TO LIVE OUT ONE'S 20S, SEAN WAS A GREAT GUITARIST AND A MUSICIAN'S MUSICIAN WHO WAS ETERNALLY UNAFRAID OF DEFENDING EVEN THE SQUAREST OF RECORDS, AND IF YOU NEVER GOT TO MEET HIM YOU MISSED OUT ON A TRUE AMERICAN ORIGINAL. THE LIKES OF WHICH THEY DON'T MAKE ANYMORE..R.I.P. 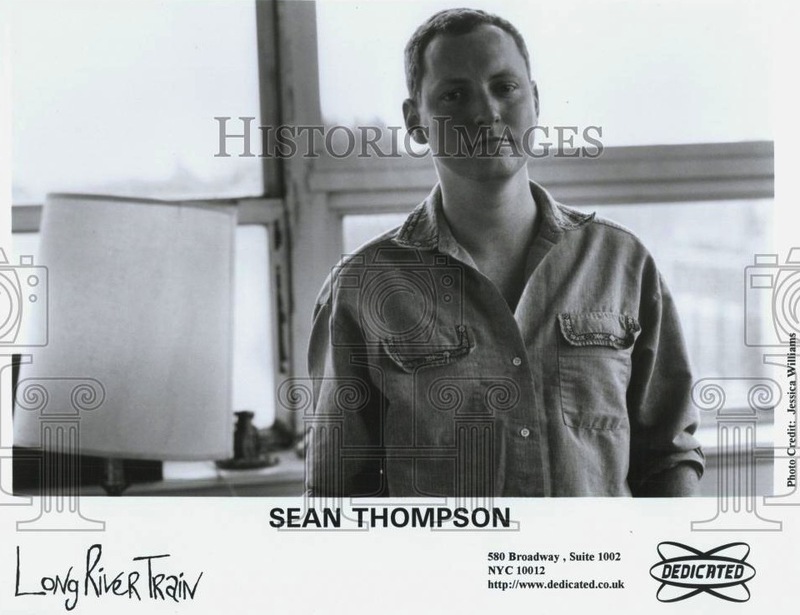 SEAN...WE LOVE YOU FOREVER..
Just came across this while I was looking for info on whatever happened to Sean Thompson and Long River Train. This is a real shame. I'm sorry you lost your friend and sorry the world lost a talented musician. If I can get this to post, I have more data on Sean. I live in Borrego Springs, CA. Sean rented a room in my house and was my roommate from March 2007 to June 2007. He was doing his music and working odd jobs, bartending, painting prep, etc. He told me that in the late '90s, recording execs or agents told him they were ordered to promote hip hop and dance music and to turn the spigot off to folk, folk rock and alt rock music. In other words, his side of the industry was no longer being funded or promoted. And if you think about it, how many Pearl Jams or Nirvanas have we seen since the late '90s? None. I think that was hard on his career and on him. Why was that done to the industry? I attribute it to the anti-white racism movement headed up by the central banksters. They want BLM and refugees, not Sean Thompson and Long River Train. By now Sean was an old pro with the music, and that was quite apparent whenever he practiced. I was highly impressed by his effortless-looking musical abilities and evocative talents. Sean was friendly but impossible to be friends with due to the drinking and tweaking and an unjustified, overbearing, smirking arrogance which was quite unbecoming to him. The local older ladies into the arts just loved him, and he was chased. He used them accordingly. I found and financed a VW Golf for Sean for only $800. It had been owned by an older German-American fellow and was in perfect condition. Sean had three fender benders in it the first two weeks, including backing up into my dad's rig right in front of us all here in the driveway. He backed up but never looked in his rv mirror. Mom ripped him a new one. My parents were here because things had gotten so out of hand with Sean's drinking that they were here to help get him out. When Sean paid back the last $600 for the car, we were already on the outs, and when he brought the check here he had forgotten his key, so he just kicked the front door in and left the check inside. One time he busted the rear screen door off its lock and latch heading out the back to puke. The rear of his room towards that rear door ended up with a big puke stain in it by the time he left. Sean and his clothing smelt like frozen vegetables from all of the booze and tweak oozing out of his pores into his clothing. I will never forget that smell, and I am not surprised at all that he caught cancer and died from it. Sean left town for Arizona a couple weeks after hitting Dad's car. I found out later he had a warrant for failure to appear for a hearing related to a DUI charge. Rather than deal with the DUI charge, he skipped the State. I tried to tell Sean's new friend in AZ what he was in store for with Sean, but he didn't pay any attention. Sean had a 50-ish friend here named Austin. Austin was not a good person, one who did not help Sean get his life going on the right track, which is undoubtedly why Sean didn't succeed here. Sean needed a good stabilizing influence, but he was not at all receptive to the idea. Though I would have liked to, as a quietly successful person, I never had any chance to influence Sean. Sean produced a music CD just before leaving town, and he put on an opening party for it at a local bar. I heard he got to drinking there and was last seen violently tossing heavy chrome barstools about in a drunken rage. Sean paid all of his rent on time and paid me back for the car. MP3S ARE A POOR SUBSTITUTE FOR VINYL.PLEASE SUPPORT THE ARTISTS AND YR LOCAL RECORD STORE BY DELETING THE TRACKS 48 HOURS AFTER YOU DOWNLOAD THEM AND PURCHASING THE RECORDS THEY WERE RECORDED FROM.THIS BLOG IS INTENDED TO CREATE AWARENESS OF OBSCURE TITLES BY TRULY TALENTED RECORDING ARTISTS WHOSE EFFORTS WERE NOT APPRECIATED ENOUGH BY THE MASSES UPON THEIR ORIGINAL RELEASE.THIS BLOG IS A CELEBRATION OF THEIR GREATNESS AND VISION.